Forming of Turning Circle & Approach Channel for Deep Water Berth for the proposed ESSAR at Hazira. To develop deep water port at their steel plant to berth ships thereby overcoming the tidal constraint in shifting the raw material by barges. 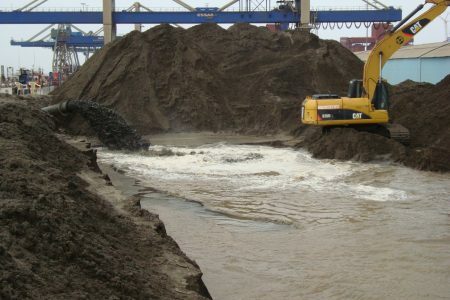 Dredging under tide variation of 7m to form a 600m dia Turning Circle and 7.5Kms Approach Channel with a bottom width of 300m followed by Land reclamation for extension of the plant. DDIL deploys Dharti XII (which has a total installed power of about 10780 KW with cutter power of 1000 KW), Dharti IX (which has a total installed power of about 3750 KW with cutter power of 295 KW) and Dharti X (which has a total installed power of about 1091 KW with cutter power of 170 KW). 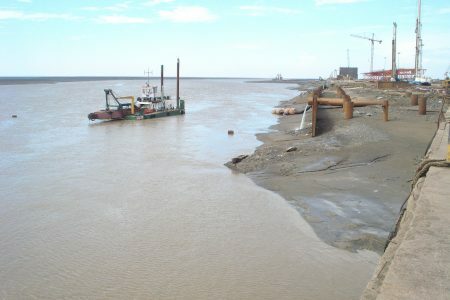 Dredge to form Turning Circle and approach channel up to 8.00m below CD. 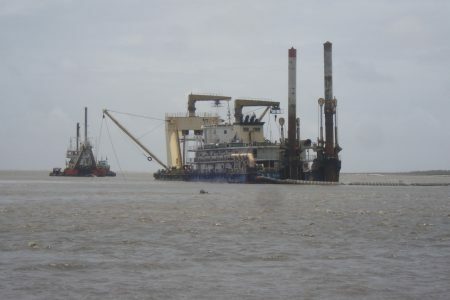 Dredging is 9.0Million M3 and involves floating pipeline of 1000m for each dredger. Land reclamation of 5.0Million M3. using dredged material transported through floating pipeline to a distance of about 4.5Kms and levelled by land moving equipments. Balance 4.0Million M3 disposed to Offshore. 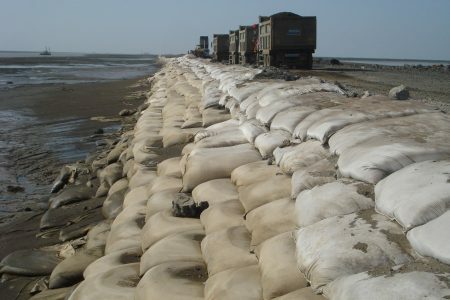 Bund with Geo bags filled with dredged material constructed to retain the dredged material. The top level of the bund is 9.0m above CD.